TU2152A Dual USB Outlet combines two USB ports with two AC power outlets to eliminate bulky wall adapters without sacrificing your outlets. Users can charge up to two devices at the same time using the two USB ports and leave the two outlets free for other power needs. The USB power outlet is compatible with USB 1.1/2.0/3.0 devices, including iPhones and iPads, Android phones and tablets, Windows phone by HTC, Kindle, e-readers and any other USB compatible products. Your iPad, iPhone, tablets, cell phones and other devices now have a better power center, and your walls will always look tidy and neat. TOPGREENER TU2152A USB Charger Receptacle can be easily installed in the wall of your bedroom, living room, kitchen, or any other room to make power charging fast, easy and convenient. The receptacle is back and side wired for broad compatibility with diverse wiring needs. Try out a special project and come up with creative ways to charge your devices while minimizing cluster and adding more functionality to your home! The product can fit in any standard in-wall outlet box. The Tamper Resistant outlet features an internal shutter mechanism that protects unwanted objects from being inserted into the receptacle. 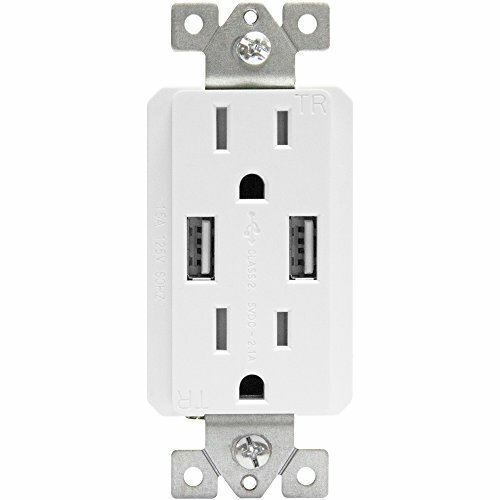 This USB charger outlet is also great for commercial use, including airports, hotels, restaurants, schools, offices, hospitals and other public areas. It is also compatible with standard decorator wall plates and can be multi-ganged with other TOPGREENER devices, such as receptacles, motion sensors, and switches. Safety is another important feature of TOPGREENER TU2152A USB Charger Receptacle. Complies with 2011 National Electrical Code (NEC) requirements and is UL listed.